After a great restful night, the global leaders were ready for the first day in Cape Town. The day began relatively early with the crew getting breakfast at 8:00am. The restaurant had an extensive variety of entrees and the students really enjoyed the sumptuous meal. The breakfast was followed by a safety orientation from the Volunteer Adventure Corps (VAC). Andrew, our contact here in Cape Town went over information that would ensure we could travel relatively safely around the city. Like any big city, care has to be taken to prevent one from falling victim to opportunistic crimes. Cape Town is a safe city as it is a very popular tourist destination. But that does not mean that crime is unheard of. Our guide told us that the best way to prevent becoming a victim is to be aware of our surrounding. Do not flash expensive watches or phones, as they tend to be popular theft items. We were also given a list of contact information that we could contact in case of an emergency. With all this information, we felt much more comfortable about exploring the city. 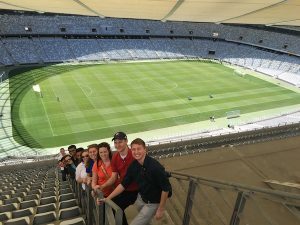 Our first tour was of the Cape Town Football Stadium. The stadium was built for the 2010 FIFA World Cup. The drive to the stadium was relatively short as everyone was busy appreciating the beautiful scenery that Cape Town has to offer. On arriving, we met up with Mr. Francois, a structural engineer who worked on the stadium. The construction of the stadium began in March, 2007 and was completed at a cost of 4.5 Billion Rand which is approximately $300 million USD based on the current exchange rate. The construction team was a joint venture between WBHO and Murray&Roberts, both local construction firms of South Africa. The construction schedule was 36 months, but since the project began late, the contractor had only 32 months to complete. Mr Francois gave us insight into various challenges the designers and construction teams had to face to conform to the local site conditions.There were three critical activities that the contractor’s had to accomplish- finish the roof construction so that the cranes could be demobilized, complete the installation of all the MEP systems in the stadium and accomplish the landscaping details outside the stadium. A lot of local and international expertise was used to be able to complete the project. 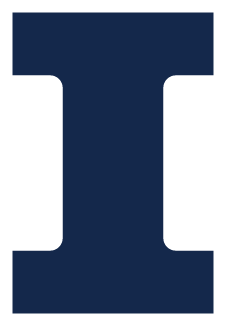 All in all, tour was very informative and insightful. After the Stadium Tour, the Global leaders had lunch at a local restaurant near the stadium. We departed for our second tour right after lunch. 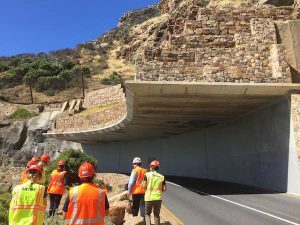 The tour was of the Chapman peak reconstruction project that ZAA engineers had executed in 2002. The beauty of the road comes from its strategic location- mountain on one side and sea on the other. Due to the steep and unstable mountainside, the road faced problems with landslides and mudslides. A consortium led by Concor was tasked the job of ensuring that the road is safe to drive on throughout the year. The team had to carry out extensive survey to determine what kind of protection would be used. 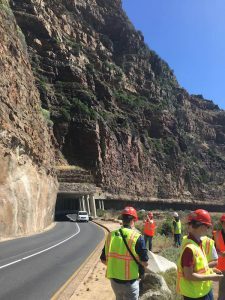 They ended up using fences, a cantilever canopy and a half-tunnel to ensure that the rocks and boulders that slid from the mountain on top, did not affect the vehicular traffic on the road. The site constraints and the delicate surroundings made the construction process difficult. But the project was completed on time and has been a success as the road is extensively used currently. VAC had arranged for us to have dinner at an authentic African restaurant. We really enjoyed the food and the ambience. It was a perfect ending to a wonderful and eventful day. We would like to thank Mr Francois and ZAA engineers for hosting us.